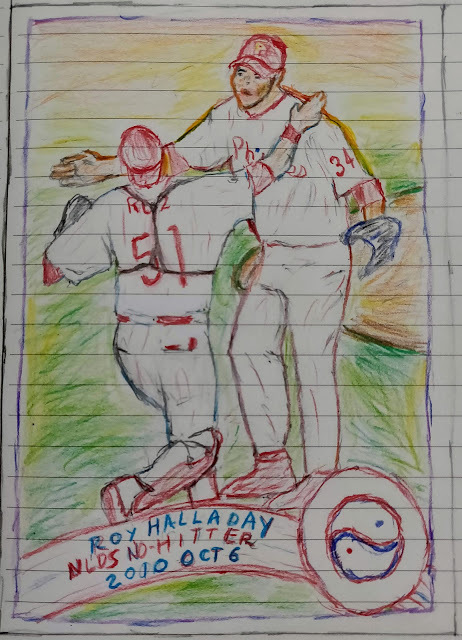 Phungo: Roy Halladay Hall of Fame!! Roy Halladay Hall of Fame!! Things have been busy around Phungo HQ with a myriad of activities that have kept me from posting regular columns here. Most of these distractions are good things including one hobby I have picked up in the last year - sketching. It may not be great, but it is mine - I had never drawn anything beyond a stick figure prior to last summer and I am pretty happy with some of the outcomes. The pictures never look like the people who I am trying to portray, however they do sort of look like people. This particular drawing is inspired by a 2011 Topps card, click here for a better look. I use color pencils and draw inspiration from folks like @Mosely_Mark and @Gummyarts who both put together some fun and exciting cardboard art. This drawing commemorates one of my favorite games and I am glad to see Roy Halladay get honored by the Hall of Fame. Awesome sketch! 10x better than anything I've ever produced. Fuji - you always have my favorite comments !! !